— Yasser, that’s a conspiracy theory. 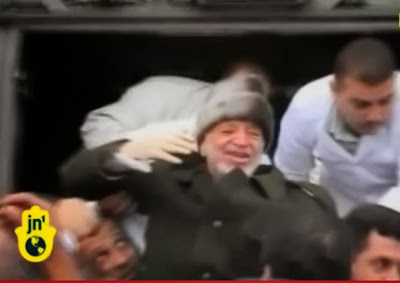 Nobel prize winning terrorist Yasir Arafat, carried by his admirers. The New York Times reports Swiss Report Supports Theory Arafat Was Poisoned. Now, of course, the New York Times isn’t the only news outlet to be reporting this. But is it news? if Arafat had ingested polonium in 2004, there simply wouldn’t be any trace of it in his remains by now. That's science not speculation. Swiss scientists say Arafat had symptoms commonly linked to radiation poisoning, including nausea, vomiting, diarrhea and liver and kidney failure — but not two other classic symptoms, hair loss and a weaker immune system. While the liver and kidney were not reported at the time, “persistent vomiting, diarrhea and stomach pains” were. As any of the last pictures of Arafat recall, (see above) his face was still adorned with a beard at the time he was brought to France for the last time. Actually these symptoms would be consistent will gall bladder disease, and Arafat, at the time, was reported to be suffering from gallstones. Like the symptoms mentioned above this too was reported by the New York Times. Why didn’t the reporter see if there was anything in her own paper’s reporting that supported her current reporting? Perusing through the New York Times article on the Swiss study the name Al Jazeera appears four times, and yet no significance is attached to this. Have you seen Al Jazeera? Here’s a screenshot. Al Jazeera is very invested in keeping this story alive and yet somehow that was also missed. Professor David Barclay, a British forensic scientist retained by Al Jazeera to interpret the results of the Swiss tests, said the findings from Arafat’s body confirmed the earlier results from traces of bodily fluids on his underwear, toothbrush and clothing. “[R]etained? !” My God!!! Neither Al Jazeera nor its expert were disinterested parties to this investigation! Ms. Arafat’s relations with the current Palestinian leadership are notoriously hostile. The reason for that is simple: money. Mr. Arafat’s most visible current financial adviser, Muhammad Rashid, is a Kurd who is believed to control nearly $1 billion in assets for Mr. Arafat and the P.L.O., Israeli officials said. But Mr. Rashid, who went to Paris to be at Mr. Arafat’s bedside, is only one of a number of financial advisers, and not necessarily the main one, they said. There’s no discussion of Arafat being poisoned, just the well financed lifestyle of his widow. But that’s not all, Mohammed Rashid plays a role in all this too. He, too, is on the outs with the PA. You see, last year shortly before Al Jazeera “broke” the story of Arafat’s poisoning, it issued a warrant for the arrest of Mohammed Rashid for embezzlement. A month later, Rashid broadcast that Mahmoud Abbas was worth $100 million. (A pittance compared to Arafat’s fortune, but, for most people, quite a lavish bounty). Oh and one of the people Al Jazeera interviewed to establish that Arafat was killed was Mohammed Rashid. Most likely the goal of the “news” of Arafat’s poisoning was to restore his reputation and that of his wife. Or at least, it was to distract Palestinians from her lavish lifestyle. Possibly it was an effort to rehabilitate Rashid at the expense of Abbas. Last year, when the “investigation” first gained attention Barry Rubin debunked and noted that the accusation was just a modern day version of that antisemitic perennial, the blood libel. Instead of doing basic research such as asking disinterested scientists, checking its own archives, or even examining the motives of people making the charges – and they certainly didn’t follow the money – the New York Times abetted a scheme to turn a corrupt murderer into a victim. The New York Times, of course was not alone in this. Accepting the Palestinian narrative unquestioningly is second nature to many in the media. And it’s not only the media. Yesterday, Secretary of State John Kerry threatened Israel even as he apparently prepares to make a bad deal rather than no deal with the world’s leading exporter of terrorism. Technorati Tag: Arafat and Polonium. Labels: Did Arafat Die of Polonium Poisoning?